Use the chart to determine if your wrist is size I, II, III, IV, V, VI or VII. 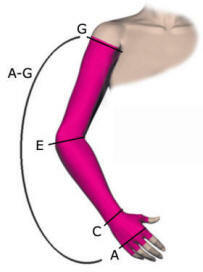 Determine your arm length (d) by measuring from the wrist to the part of the arm where the armpit starts. If your arm is 17.25" (44cm) or shorter, you wear a Standard length. If your arm is 17.25" (44cm) or longer, you wear a Long length. If one of your measurements does not fall within the size range listed, you may need a custom order garment. Talk to your therapist or doctor.